View of “The View Through the Bull of a Manual Laborer of Menagerie Gussied over White Ground: Twenty Years of Self-Loathing and Intestinal Mishaps,” 2012, Tyler Rollins Fine Art, New York. Philippines-born artist Manuel Ocampo is currently based in Manila, where he runs the gallery Dept. of Avant-Garde Cliches and is about to launch an alternative art school called Bureau of Artistic Rehab. Ocampo’s curatorial project “Bastards of Misrepresentation,” a multivenue survey of current art from Manila, recently opened in New York and will continue at Topaz Arts in Queens until December 30. 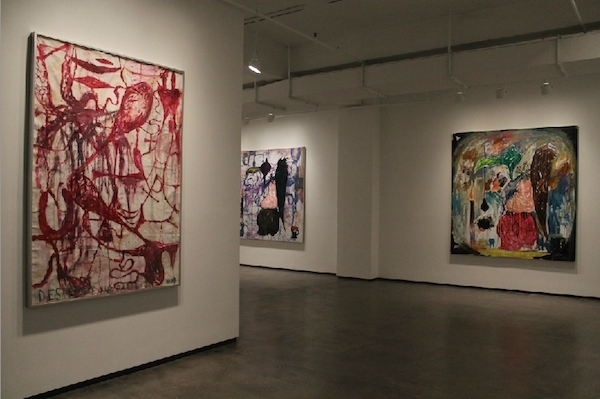 A solo exhibition of his recent work is on view at Tyler Rollins Fine Art in Manhattan until December 22. THE ART SCENE IN MANILA is very dynamic and in 2003, I decided to move back here from Los Angeles. The galleries were small, often located in shopping malls—but there were openings almost every day and prices were low. I started to collect local artists. About five years later, dealers started opening spaces in warehouses—it was almost like the migration from SoHo to Chelsea in New York during the ’90s. With this transition, galleries became very market-focused, and a contingent of artists began to gear their work toward collectors. Last year I opened a gallery devoted to prints and multiples in order to stimulate a market for cheaper works that can support an artist’s major output. I also became active in organizing exhibitions here and in cities including Berlin, Hamburg, Bangkok, and New York, featuring artists working within the cultural context of Manila, which is visceral, in-your-face, and anti-Conceptual. The three exhibitions that are part of “Bastards of Misrepresentation” are all in Queens, which may be peripheral in terms of the New York art world but I thought it crucial to mount such an exhibition now. The art world in Manila is gaining prominence in New Yorklargely due to dealers such as Tyler Rollins and Emmanuel Perrotinand I wanted to showcase the artists we work with. These are not just Philippine artists but others based in Manila: There is a German in the show and an Australian, and others are based in Paris and Berlin but active locally. The artists I work with are not necessarily market-friendly. Take Robert Langenegger, who creates intelligent yet perverse and vulgar paintings, or Lena Cobangbang and her work with graffiti artists. One of the reasons I use the mantle “Bastards of Misrepresentation” is because Manila artists can be misrepresented by a certain kind of art typical of the auction scene—I wanted to present a different view. In Manila there are no government institutions to support artists. As a result, we raise money ourselves by raffling works and collaborating with designers to make T-shirts and bags. This helps us finance shipping and catalogues, and allows us to produce exhibitions internationally. We don’t want to wait for somebody to invite us to have a show in Berlin or New York. We do it ourselves. I don’t really know if there is a great difference between my paintings now and earlier. While I’ve mostly left behind colonial Catholic imagery, it continues to come in and out whenever the occasion strikes me. When I returned to Manila my paintings were like large drawings and I also started to work in monochrome. But my current show at Tyler Rollins reintroduces color. I am interested in the ambiguities of certain symbols or motifs like vultures, the American eagle or how a chicken drumstick can look like a fetus. These motifs also carry a comic vulgarity. Are my works nihilistic? I don’t know. In the Philippines, nothing is ever seriouseveryone makes fun of each other. It’s surprising how serious people are in New York.